Most carriages have external lights, but I haven't seen interior lights myself. Maybe travelling in the dark was considered too dangerous when holes and rocks on the road, let alone the road itself, can't be seen, so the constructors probably didn't see a need for lights on the inside. The exterior lanterns were probably only for decoration because they would be too weak to illuminate the road in front of the horses. Still, interior lights would make sense to allow the occupants to generally see what they're doing. Some might want to read their notes when the coach isn't rocking them about. There's also a gameplay side. It might be more interesting if the player has to consciously stay crouched to avoid being spotted through the windows, rather than being in an easy safe haven. As for what they'd look like, they should be closed and firmly fixed to avoid the risk of fire. Small lanterns like Bikerdude's would fit that description. Small lanterns like Bikerdude's would fit that description. That seems like the kind of thing mappers could do if they choose--they could just add a haning lamp inside the carriage. I don't think it should be built into the actual coach model. That seems like the kind of thing mappers could do if they choose--they could just add a haning lamp inside the carriage. Not enough head room, so would have to be fore and aft like I have done in the above video. They can add it wherever they want; my point is that it should be up to mappers to decide if they want any interior lights and what kind, rather than having them built into the model. One thing that would be helpful is to have a version of the coach with the wheels removed, and a separate wheel model available (centered around the origin). That way industrious mappers can make a moving version of the coach with wheel that turn. One thing that would be helpful is to have a version of the coach with the wheels removed, and a separate wheel model available (centered around the origin). Dragofer has already created those, would you like me to ahead and add thew modle package to SVN? Sure. Under "misc" I guess. Yes, that's what I was thinking of. My plan would be to either update the prefab with suitable existing lantern models or make a model out of a modified exterior lantern to keep the same style. @Dragofer, could you knock up a set of reins & brace models for the horses and the small set of steps model for the passengers? Something of a ‘What are you working on’ status update after watching countless Blender vids and memorising even more Blender shortcuts. I’m pretty sure by now that every possible combination of ctrl/alt/shift and letters has a function in that program. Here’s a brass lamp Taquito posted in the Inspiration Thread a while ago. I quite liked the style of it so that became the first thing to make a high-poly model for, minus the steampunk modifications. The low poly is at 1300 tris at the moment. The next learning curve is to figure out how to use GIMP to turn photographs into flat model-appropriate textures. Although it didn’t really turn out that bad when I just tacked on the reference photo. 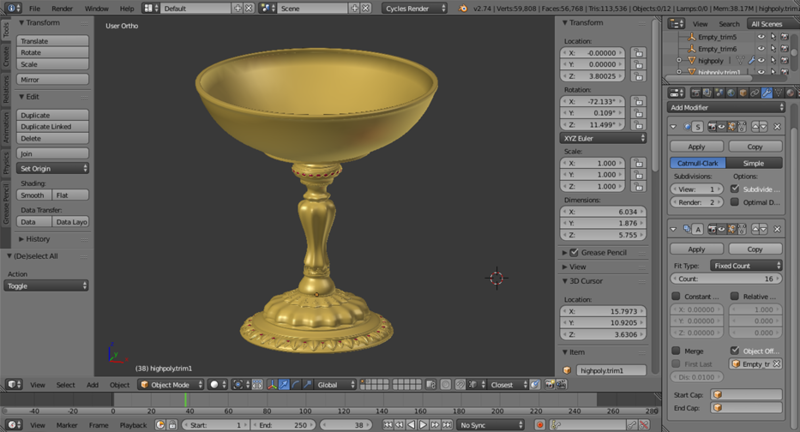 The next high-poly was this chalice. The low-poly is at 920 tris at the moment. Just pasting the reference onto the model worked quite well again. They made the bowl with a wavy pattern, but recreating that in a model would cost a few thousand tris. 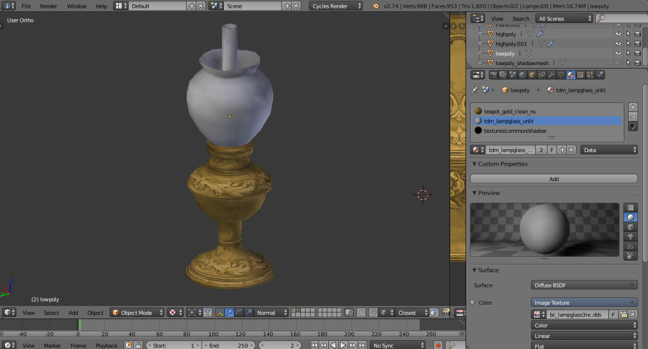 Maybe a normalmap would help, but I've been fiddling for a long time now just in attempts to get the plain bowl normalmap to look... clean without triangles? Also, strangely enough some of the trim details only show up as lone black pixels in the normalmap. 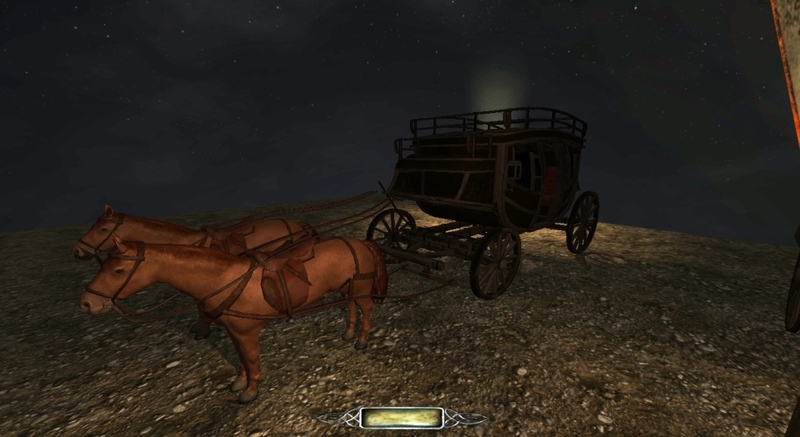 Thinking that my DarkRadiant modelling days were over, I tried importing a horse to make a properly fitted harness for my stagecoach that could follow the horse’s animations. But the importer turns up with this error (other md5meshes had no problems with being imported). Google doesn’t recognise this error unfortunately. I'm guessing Blender isn't reliable enough to work with md5's at the moment, so back to my patchwork harness (870 tris including inner faces, no long thin tris). The close fit in this screenshot is slightly on the optimistic side though. Did anyone notice the saddles as being strange for horses pulling a coach? The thing I'm interested in is the headpiece, but all the horses with headpieces also have saddles. Edited by Dragofer, 15 October 2015 - 12:05 PM. I haven't forgoten about your alter, just been busy with the WIp Im curently trying to get ready for beta testing. Very nice work there my friend, both with the carriage and those models your working on. Its great you are working and learning the modeler, but to be honest, its overkill to make a highpoly version for most models you would want to put in the game. Im not saying this to discourage you in any way, that are models we fall in love with and want to make them perfect, but energy and time wise, its simply not desirable to devote so much for most game-ready models - you have to consider the scale of it (how well the player will be able to observe it up close), the use of it (if its just scenery or if the player will have actual contact with it for important reasons), the game's stabilished level of detail and aesthetics. Its possible to justify having more details on basicly any model (the player *can* pick it up and look at it out of curiosity for example), but for the most part, you can get away with very simple meshes, and then devote some time to get the texture right in photoshop/gimp, even working on their surface geometry by drawing the bumpmap/normal. For small objects, normal maps are actually not really good in my opinion for surface details. 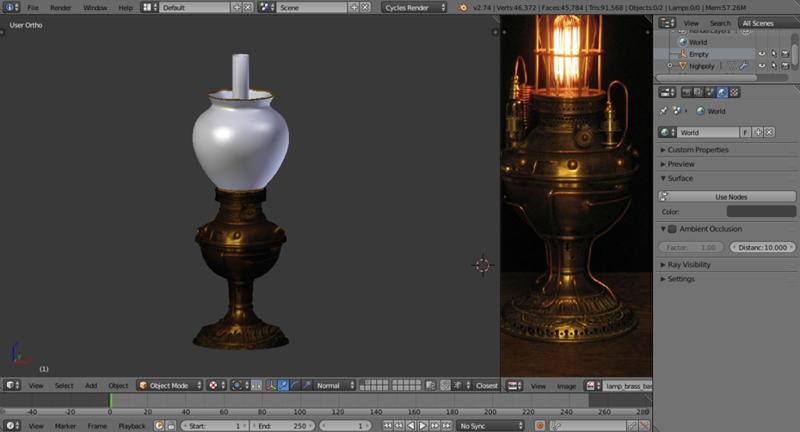 They are not that sharp (you dont want overly large textures) and tend to make the object look rough. 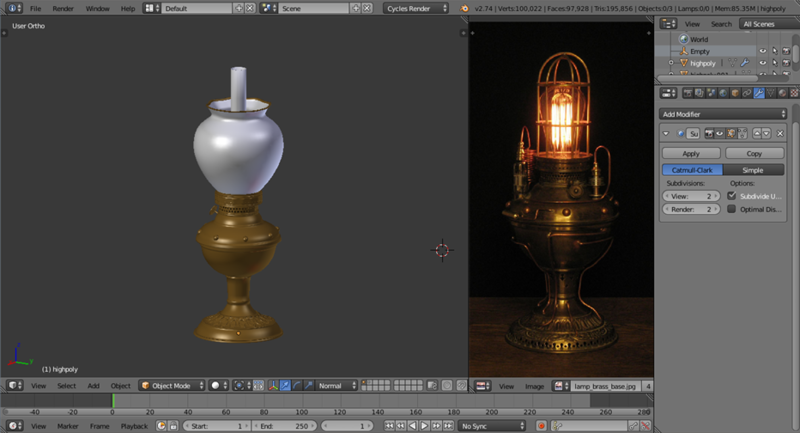 A lot of it (like small bumps in a metal surface) can be solved by a good diffuse and specular map alone. Of course your learning right now, but in the future you will want to budget your work for each model, specially if you want to make a good number of them available. Good texturing saves a lot of tris but also takes most of the "modeling" time. I quite like your artistic choices and would love to see those models in the game, btw. Any chance I can grab this for my upcoming wip..? ...its overkill to make a highpoly version for most models you would want to put in the game. Don't you always want to make a high-poly version to create a good normal map for the lower poly versions? Normal maps aren't just for surface detail, they also make lower-poly versions look higher poly by smoothing out the shading. It's overkill to make a highpoly version for most models you would want to put in the game. I quite agree, thanks for pointing this out. It's fun to find out more and more methods to come to a smooth and detailed item without thinking so much of how to get it into a game, but in the end your suggestion of working more with the texture instead is a much more effective use of the time. 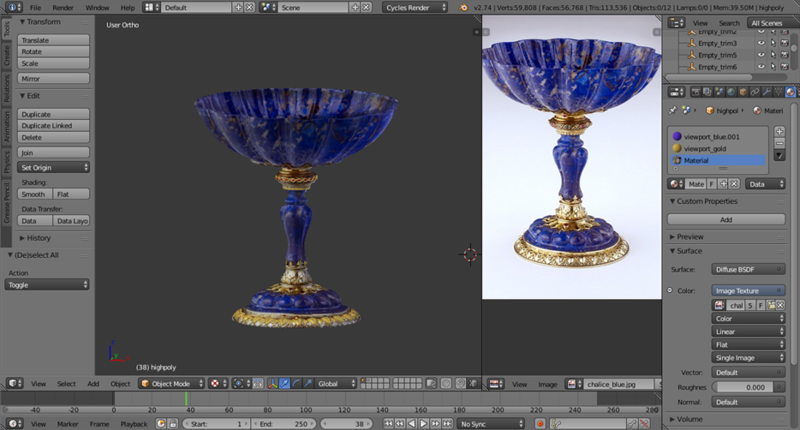 And as you said, you'd need a high-resolution normalmap to see the benefits from the highpoly - the chalice looks very rough if the normalmap is only 512 x 512. - For some reason inside DR the lit shader (bc_lampglass) has an unlit editor image and the unlit shader (tdm_lampglass_unlit) has a lit editor image. But it's correct ingame. Edited by Dragofer, 22 October 2015 - 03:41 PM. the model appears to be broken as I am only seeing two small discs in DR.
Not quite, my friend. Smoothing values for the mesh can be set at any angle regardless of a normal map. Its just info the model carries. The normal map is used mostly to fake detail on flat/smoothed surfaces. But since you can use converters to turn bumpmaps into normalmaps, it can often be about drawing them or adjusting the grayscale diffuse by hand and then converting to normal. Thats what I did for the warhammer model, the part where theres an engraved area on the head. Its a pic I treated before converting to normal and it works fine. Making a highpoly sculpt, specially for linear, geometric stuff, is a pain. I would reserve doing that only for AI and HUD models, or stuff you are definitely going to be seeing upclose a lot. Even then, a lot if not all can be done texture wise, if sculpting is not your thing. But its up to the artist. Edited by RPGista, 22 October 2015 - 01:57 PM. The model still has way too many tris, DR becomes very laggy when adding it and trying to move it around. Something was still broken but I fixed it, you had the wrong model name/path in the .def. Moving forward, always export models with the origin at the base - its so that when the mapper used the 'floor selection' button in DR the models stops on the first horizontal surface it comes into contact with. Moving forward, always export models with the original at the base - its so that when the mapper used the 'floor selection' button in DR the models stops on the first horizontal surface it comes into contact with. That works regardless of where the origin is. hmm, I have found in that the models stops where the origin is, not at the bottom face of said model. - A caravel is a 15th century merchant's ship of modest size, a common sight in canals and smaller harbours but also capable of making long ocean voyages. - 2 things I've taken care to do were to avoid long thin triangles, so the ropes and masts have extra subdivisons. The other was to use textures economically. 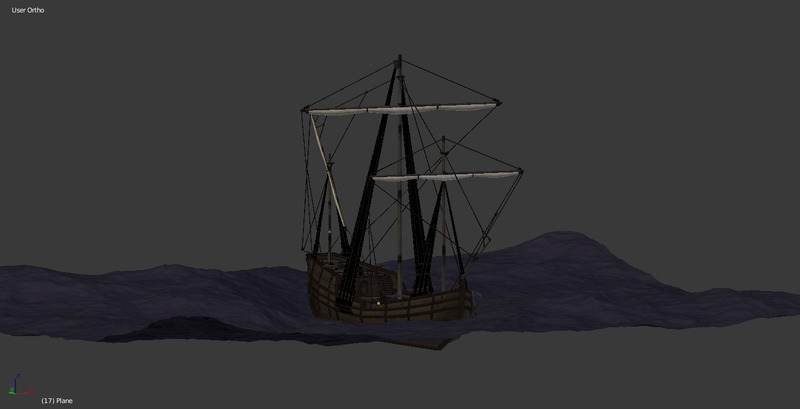 - caravel_model.lwo, 8600 tris of which 300 shadowmesh, a 1:80 scale model which includes rigging, wheel etc. Edited by Dragofer, 29 June 2017 - 10:15 AM. You definitely did top notch work here, and Im judging by the renders only, and the description - the attention to detail, how everything was thougt out and organized. Awesome contribution man, hugely appreciated. By the way, whats with all the likes and the silence, lets speak to each other more, you shy people. Edited by RPGista, 05 April 2016 - 10:41 PM. By the way, whats with all the likes and the silence, lets speak to each other more, you shy people.